PLUG & STEM ASSEMBLYCONSISTING OF:040006-281-D VALVE PLUG11156-1-A STEM971342-001-B STEM PIN..
P/F Masoneilan control valve series 3500Size 6" Camflex II Diaphragm00-035106040-716 ..
Part for 21000 Series Globe Control Valve Plug Part N..
Part for 41000 Series Globe Control Valve Plug Part No. 040..
P/F Masoneilan Filter Regulator Model: PL-5015Spring Range: 5-100 PSIP/N: 000041054-009..
MASONEILAN MODEL 78 SERIES; AIR FILTER REGULATORS; series 78 ..
CONTROL VALVE TYPE: 38-41314 &nb..
DIAPHRAGM 2.88 OD .020 TH PILO NO. 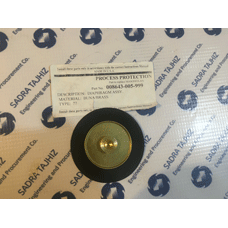 060188001659 FOR CONTROL VALVEP/N: 060188001-659-0000Manufacturer..
P/F Masoneilan filter regulator Model PL-5015Diaphragm Assembly P/N: 0086..
DIAPHRAGM FOR CONTROLE VALVE, MODEL NO. 35 - 35212 SERIES 35002 P/N: 035104040-716-0000PAR..
DIAPHRAGM 7 A, Diaphragm Part # : 035107-040-716 Control Valve, Camflex II, Model Number 35-352..